- ITP's Delta wheels feature s a lightweight D-window center design. 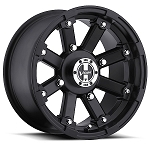 - Precision rolled atv rims with stamped high strength centers; they're 35% stronger than OEM wheels. - Shop around and compare the price with other OEM replacement atv wheels, the ITP Delta is an excellent value! - Provides a wide range of OEM replacement options for all popular models in the utility 4x4 category. Received the 4+3 steel delta wheels quickly. Fit perfectly on my 2014 Polaris sportsman 570. Put the 28" maxxi zillas on them & very pleased. These wheels are great..The 2+5 offset on the teryx works GREAT..Its a cheap was to widen the UTV 4in in the front and rear..I would tell anybody with a Teryx to order these wheels..They also don't stick out so far that you can not go through the trails..Cause thats all the riding I do and they work awesome..
Only one issue with my experience. Prices were good, shipping was great and product seems to be high quality and working well. The only issue I had was the website said "all Yamaha rhino models"... What it did not say was that the replacement was not compatible with the original so after receiving the only one I "needed",, I had to order a 2nd one so both rears would have the same offset.. Had I known, I could have ordered two at the same time and saved shipping cost. As it is, I had to pay shipping on Both wheels. The website should tell us we cannot match your wheel with an original.. Otherwise, I am extremely pleased with my experience. Great looking rim for the money, just wanted a simple, clean look. pureoffroad mounted tires on them for me and shipped fast. Showed up ready to bolt on, great experience ! Quality item, just installed but no doubt these are more durable and better looking than OEM if you don't want the "bling" look of the aluminum wheels. Fits nicely on my Polaris XP. This was purchased for a spare tire. a simple wheel but it will do the job. Fit perfectly. The rims looked really good with my new Sparticus tires. I was also impressed with getting new lug nuts also. Thanks for what ya'll do! Kenny B. Purchased two of these ITP Delta rims to use on the front of my 2005 Polaris Sportsman 500 HO when upsizing from the stock tire size of 26x8R-12 to the STI Rocktane's (26x9R-12) in order to allow the larger tires to clear the upper ball joints. These rims came with a set of longer, chrome lug nuts, too, which was a nice bonus! I've put about 100 miles on these rims so far. So far, so good! I will most likely purchase another set of 2 ITP Delta rims in the near future so that I have uniformity with my wheels on my rig. I ordered these to go along with the GBC Dirt devil tires, as I said in the review of the tires. Pure Off Road is awesome, got them mounted and ready to ride in 2 days. Great Option over OEM rims that Polaris wanted a bit more for and bonus were the longer lug nuts that came with them, didn't expect those. Replaced stock wheels on Kubota RTV for landfill (harsh) use they are holding up fine. These and my Spartacus Tires also sourced from Pure Offroad have proven to be a tough combination. Where the stock wheels would bend when climbing riprap, these hold up great. I will be buying more of these economical wheels when these inevitably succumb to the harsh rigors of landfill life. Mounted the 26X9R-12 STI Roctane XD tire on the 12 inch rims. These rims are, by far, much better built than my OEM rims that came on my Honda. Also the center caps, that come with the rim, are designed so you can't loose them. Great product for the price. I put these wheels on my King Quad 750, and man do they look good! I really like how Pure Offroad included the center caps and lugs too. When I had a question about shipping, it was answered immediately! The powder coat really looks awesome! I would recommend these wheels. Thanks again guys! These wheels were just what we needed for our Polaris UTV. Great look. I'm using these new wheel with a new set of tires from Pure OffRoad. These are very nice wheels. Cannot beat the price or look. I put these on my new UTV and they make it look better than the alloy ones it came with. Great, sharp looking and good quality wheels for the price. Q: Looking for 12 inch steel rim to fit a 2014 Polaris Ranger 900xp....? Q: will this fit Polaris ranger 400 looking for stock wheel 25x8x12? A: Yes these fit. You need the 4/156 bolt pattern. A: If you want the exact offset you will have to buy your rims from Honda. These are really close. They will stick out just a bit wider. Less than 1 inch. Q: 2015 Ranger 570 crew mid size will this fit for the front spare ? A: Yes it will fit your machine just fine. Q: is there any rim available in size 12 inches with pcd 4/100? A: Unfortunately no, these are only offered in a 12x7 but they will still work on your Gator just fine. Q: Need 2 rims, black steel, 12 " diameter X 8" wide 4/137 bolt pattern, offset 3" inside. 10 mm lug nuts. If have send stock # so I can order? A: We don't currently have any 12x8 steel rims. These are the closest thing we have to what you are looking for. They are 12x7. Q: I bought these wheels for an 09 ranger 700xp. problem is the wheel bearings in the hubs are open to debris. do they sell dust covers for them? A: ITP doesn't make center caps for these rims that will fit Polaris. They only offer center caps for these to fit the 4/110 (honda, yamaha, suzuki) bolt pattern which is much smaller so they wouldn't fit your rims. Q: i have a cub cadet volunteer with a tire size of 25x10x12. i need new rim due to rust. it has 5 lugs and they are spaced 2 3/4 center to center. i don't know how to figure a rim help thanks ?? A: I'm sure you need the 5/4.5 bolt pattern that this rim is offered in. Give me a call and I can help you figure that out. 877-852-2314 ask for Spence. Q: Will these fit a 2001 Yamaha Banshee 350 hub and a CARLISLE ACT 23X7RX12 tire? I would assume so since the bolt pattern and tire width is the same but I'd like another perspective before purchasing. Q: I want to purchase two full sets of these turf tires for my sportsman 500 HO's 06 and 04 models. I would rather not purchase 8 new rims if it can be avoided. Do you have turf tires that will fit both the OEM front AND rear rims so I can order them? Q: I have a 1999 prairie 400 4x4 and need new rims and tires. 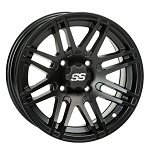 i was looking into the Part Number:ITPDELBLK12-D12F515 but im not sure if they will fit front tires 25x8x12 and rear tires 25x11x10 could you let me know if these rims will fit? A: Hi, Yes these rims would work with 25x8-12 tires but they will NOT work with 25x11-10 tires. You would need to buy new tires for the rear. In a 25x10-12 or any other size that fits 12 inch rims. Let us know if you have any other questions or give us a call and we'll help you put this order together. Q: I recently bought tires that are a little bigger than my stock ones and i need to find wheels that fit the new tires and fit my atv. I have a 2000 polaris xplorer 400 and the new tires are 25x10-12.? Q: Will these fit a 2002 polaris trail boss? A: Yes they will. The fronts and rears are different. This is offered in the bolt pattern you need for both. Let us know. thanks! Q: Can I mount a 27x12 in tire to this wheel ? Q: I have a 2016 Honda Pioneer 1000EPS, What is the correct part# for the rim that fits the front? The tires are 27x9.00 - 12. A: These only come in one size and offset for the pioneer. It's a 4/137 12mm 12x7 4+3. Just select Honda Pioneer 1000 from our application pull down and we'll send you the rim you need for that machine. A: Yes your 25x10-12 tires will fit 12x7 rims just fine. A: No I don't think these would fit if you have tried stock Gator wheels and they didn't work. I could supply you with 14 inch rims so you wouldn't have that issue but I wouldn't have any 20" tall tires to fit those 14 inch rims. Q: Will these fit on a Yamaha Grizzly 600 (not sure of year but I think it is 98 or 99)? A: Yes they will. You need 4/110 5+2 for the front and 4/110 2+5 for the rear. Q: I have kawasaki lakota with 10 rim 4x156 bolt pattern will that black 12 in rim fit my bike and can u give me idea of any other 12 inch rim from manafactur say like polaris or any other I could try find will going from 10 in to 12 in bring my bike up 2 in , thank u so much in advance for any help u can give me? A: Yes this rim will fit your machine. We may have other options as well. Give me a call if you want to discuss and get some ordered. 877-852-2314 ask for Spence. A: Yes this will fit your Ranger EV. Yes this will fit your tire that you need a rim for. Q: I have a 2007 Yamaha Rhino 660. My existing rim sizes are 12x6.0 (front) and 12x7.5 (rear) with 25x8x12 tires (Front) and 25x10x12 tires (rear). I do not see these exact rim sizes in your inventory. Which rim(s) should I purchase? A: Our aftermarket rims are all 4 the same size. They don't make them in 2 different widths like your factory wheels. You would use these 12x7 rims with your 25x8 and 25x10 tires. 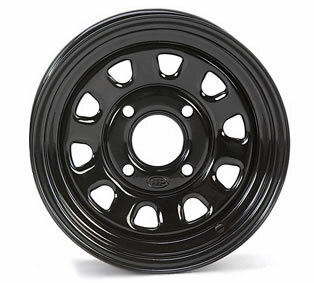 Q: Will this wheel fit my rzr tire size 26x8-12? Q: Will this rim fit a 2011 kawasaki mule kaf620m 4010? A: Yes these fit your model. Just make sure you select the 4/137 12mm option. Q: is the center in this rim big enough to fit the 2009 Polaris ranger 700 4x4 efi ? Q: I have a 2015 rzr 900 s, I see this wheel says only up to 2014? Do you sell a similiar wheel for a 2015? A: These wheels will not fit the newer Polaris models with 12mm studs. The holes in these rims are drilled out for the 3/8 studs that the older Polaris models use. We don't carry any steel wheels to fit your model. Any of our Alloy wheels would work though. Q: looking for a black stock 12x6.0 rim for my 660 grizzly, 4x110 5+2 ?